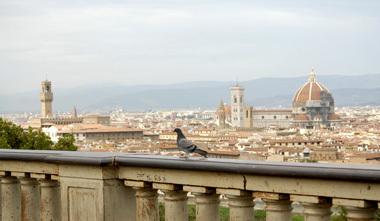 Florence Piazzas | Travel to Florence.com, your online travel guide. There is no better way to learn about any location than seeking out its main squares or piazzas. Florence Piazzas have been used for hundreds, sometimes thousands of years to announce important news , preach and even a hanging or two. From the Dominican priest Girolamo Savonarola and his burning of books, arts and anything percieved to be imoral in the Piazza della Signoria to the spectacular Piazzale Michelangelo which was made to honor Florence's favorite citizen, you will feel the enormity of the history that took place there and the simplicity of everyday life. 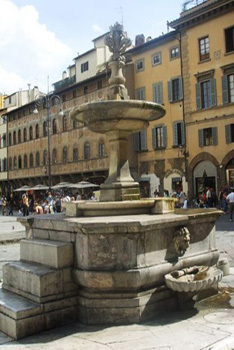 Below is a list of "can't miss" piazzas that you must see when in Florence. Grab a seat in a cafe, relax and drink in the atmosphere and beauty that Florentines have been enjoying for over 500 years.